Fluffy Banana Cake with Banana Filling | Light-as-Air, Amazing Recipe! Fluffy Banana Cake with Banana Filling has a light-as-air banana cake layered with creamy, fresh banana filling all covered in whipped cream frosting. If you are looking for THE BEST BANANA CAKE RECIPE EVER, you’ve come to the right place! What Makes This The Best Banana Layer Cake Ever? Light, fluffy banana cake is hard to achieve because baking with bananas gives a moist, dense crumb. For this cake I wanted an airy, light, fluffy CAKE and not something resembling the texture of banana bread. Separating the eggs, whipping the whites separately, and folding them in helps achieve a fluffy cake. Sandwich the layers with a fresh banana cream filling and slather it with white or chocolate whipped cream frosting, and you’ve made the best banana cake recipe ever! What Kind of Frosting Goes Best with Banana Cake? This is a matter of preference, but I believe a whipped cream frosting doesn’t weigh down the light and fluffy banana cake. Traditionally I make Fluffy Banana Cake recipe with the white whipped cream frosting included in the recipe card. The frosting is very stable and holds up for several days. Then I made the “mistake” of pairing the banana cake with a Chocolate Whipped Cream Frosting. My kids have never allowed me to look back. I can’t say I blame them. Traditionally banana cake is topped with a cream cheese frosting. I have no problem with any sort of frosting, and they are all winners in my book! Can I Freeze Banana Cake? Yes, and I fully take advantage to save myself from polishing off an entire cake! Make the cake, banana filling, frosting, and assemble the cake. Place toothpicks around the frosting and loosely wrap with plastic wrap. Once the cake has frozen, wrap more securely with plastic wrap. Thaw for 48 hours in the refrigerator. Wrap individually cut leftover slices in plastic wrap. Freeze until solid and then place slices in a ziplock freezer bag. Thaw slices on counter for 1 hour or in the refrigerator for a few hours. Make all the components of the cake and freeze separately. Thaw cake layers on counter. The whipped cream frosting and banana filling should be thawed in the refrigerator for 24 hours. Assemble the cake as directed. I know you want to eat this cake right now and you don’t want to wait five days for your bananas to get really ripe. So just throw the ones you do have on a foil-lined baking sheet in a 400ºF oven for 20 minutes, flipping halfway through, until the skins are completely black. Voila! No excuses. Now go make this cake. First mash the bananas with lemon juice, mix together dry ingredients, and prepare the cake pans. Next beat the butter and sugar together until very pale, light, and fluffy. Add egg yolks and extracts. Mix in flour alternating with buttermilk into the butter mixture. End by mixing in bananas. Beat egg whites separately until stiff. Fold gently into cake batter. Bake as directed. Meanwhile, place all the ingredients for the banana filling in a saucepan if using an immersion blender. Otherwise blend ingredients together using a blender or food processor. Transfer to saucepan. Heat banana filling ingredients until very thick and the mixture cleanly leaves the sides of pan while being stirred. Layer the banana cake layers with fresh banana filling. Cover with whipped cream frosting (recipe below) or Chocolate Whipped Cream Frosting (click here for recipe). This banana cake recipe calls for three 9″ cake pans. If you do not have three pans, bake the layers in stages. Cover the cake batter with plastic wrap and leave on the counter until ready to use. Make sure cake pans are cool before pouring batter in. The recipe card includes a white whipped cream frosting. 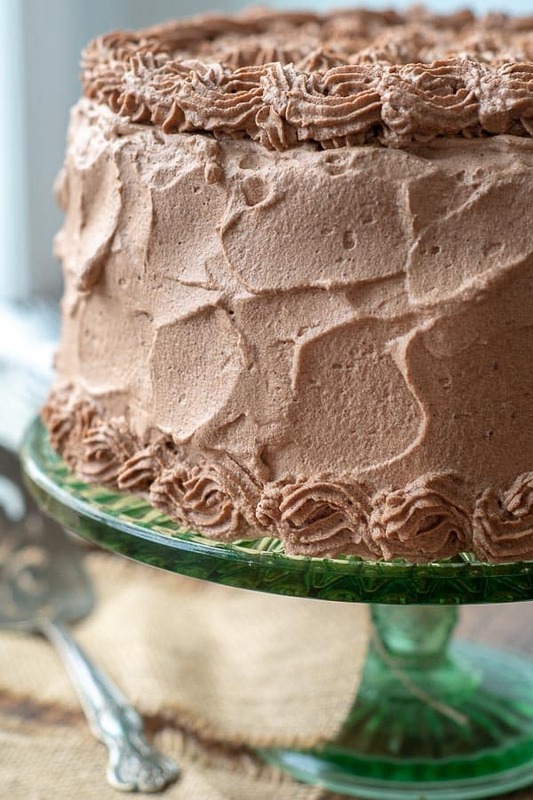 However, my family always requests Chocolate Whipped Cream Frosting, which you can find the recipe here. Room temperature ingredients are key when baking cakes. Separate the eggs and have them come to room temperature. Room temperature butter, eggs, and dairy ingredients bind together more uniformly, creating a smoother, lighter, and better incorporated batter. Check out Almond Joy Cake recipe for tips on bringing ingredients to room temperature quickly. SAVE THIS FLUFFY BANANA CAKE RECIPE TO YOUR PINTEREST BOARD! Fluffy Banana Cake with Banana Filling is a light-as-air banana layer cake with creamy, fresh banana filling all covered in whipped cream frosting. Preheat oven to 350ºF. Spray three 9 inch cake pans with cooking spray. Line each bottom with a cut-to-size parchment or wax paper circle. Spray tops of paper and set aside. Tip: If you only have 2 9" cake pans, bake 2 layers, and store remaining batter covered on counter. Bake 3rd layer in COOLED cake pan. In a small bowl, mix mashed bananas with lemon juice and set aside. In a medium bowl whisk together flour, baking soda, baking powder and salt. Set aside. In a large bowl cream 3/4 cup butter with sugar until light and fluffy, at least 3 minutes. Beat in the egg yolks one at a time, then mix in vanilla and (optional) banana extracts. Add about 1/3 of the flour mixture and alternate with about 1/3 buttermilk. Repeat until all the flour and buttermilk has been mixed in. Mix in banana mixture. In a separate clean, dry bowl beat the reserved egg whites until stiff. Fold 1/3 of the egg whites into the banana batter, then gently fold in the remaining 2/3 until no streaks remain. Divide the batter between the prepared pans. Bake for 30-33 minutes (about 5 minutes longer if using gluten free flour) or until toothpick inserted at center comes out clean. Turn onto wire racks and cool completely. Place all the banana filling ingredients in a blender or food processor and blend until fully incorporated and smooth. If you have an immersion blender, put everything in medium saucepan and blend it in there. Pour mixture into medium saucepan over medium-low heat. Stir frequently until the mixture becomes very thick and starts to boil, about 10-15 minutes. If the filling starts to boil before it is thick enough, lower the heat more. When the filling starts to cleanly pull away from sides of pan while stirring it is done (see pic in post). Remove from heat and cool completely. I recommend chilling the filling until cold so it sticks to the cake layers and doesn't slide around. Makes 2 cups. Place the sugar and cornstarch in a small saucepan. Measure 1 1/2 cups of heavy cream and remove 6 tablespoons, adding it to the saucepan. Place the remaining measured cream in the refrigerator. Heat the sugar, cornstarch, and 6 tablespoons of heavy cream over medium heat, whisking constantly and bring to a boil. Remove from the heat, stir in the vanilla, and let cool completely, about 45 minutes (can refrigerate to speed up process, but stir occasionally). After the cornstarch mixture has cooled beat the remaining chilled cream until tracks begin to show, about 2 minutes. Add the cornstarch mixture and continue beating until stiff peaks form, about 1 to 2 minutes more. Place cake layer on serving platter and pour 1/2 the banana curd filling in the middle and smooth out until it reaches the edge. Gently place 2nd layer on top and repeat. Place top layer on and smooth whipped cream all over the outside of the cake. You can make the cake layers ahead, cool completely, wrap tightly and freeze until you are ready to assemble the cake. The Banana Filling will stay for a week in the fridge, stored in an airtight container. The regular whipped cream frosting is very stable and can be stored covered in the fridge for a couple days in an airtight container. I am making this cake for a special occasion. I just tried to make the filling and it s has thickened, tho not to the point of pulling away from the side of the pan, and it has curdled. What have I done wrong? Can you tell me how many grams of banana should be used for the filling? Thanks! I’m not sure I know what you mean by curdled. The filling got lumpy? If that’s the case you can whisk in a little water or milk. If you’re worried about it not being thick enough, it will thicken up upon refrigeration. Three bananas will be about 560 grams (with peels on). Also, I just wanted to make sure you saw there is a metric conversion under the ingredients. I know that doesn’t help with the amount of bananas, but it will convert everything else. I do hope this works out for you! I know how frustrating that can be when something isn’t turning out for a special occasion. Hey thanks for the awesome recipe! I’ve made this a few times and it’s gorgeous! Hey Lily, thanks so much for writing and I totally understand. No problem at all! Is this the photo you were looking for? https://www.pinterest.com/pin/241646336236582980/ If not, please let me know and I can try a couple others. Yes, this is definitely lighter in color, not dark like banana bread. Happy birthday to your little one! Hello! 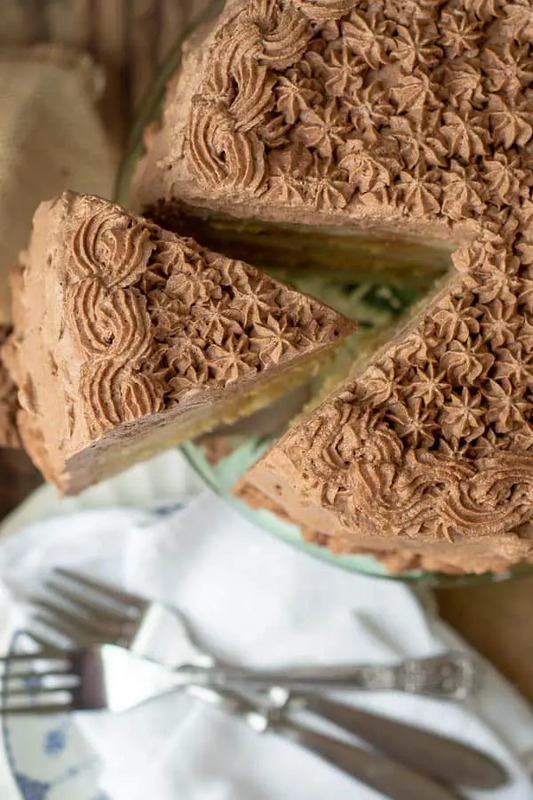 How long can this cake sit out on the counter? Can I assemble it before people arrive for the party and then serve it 3 hours later without needing to refrigerate it? I’ve definitely let it sit out for a few hours before and it’s been fine. If you want to be safe, though, just assemble it before the party, refrigerate it, and let it sit out for at least a hour before serving. I always think room temperature cake just tastes better! Enjoy! I made this for my husband’s birthday yesterday, and my family LOVED it. My teenager who “doesn’t like cake” (what?!?) ate 2 pieces of it! It has been deemed the best cake ever. I made it with the chocolate whipped cream frosting which was perfect with the cake and not overly sweet. Thanks for this awesome recipe! That’s funny because I made this cake yesterday too! I’m making it ahead of time and freezing it for my birthday next week. I’m so glad your family enjoyed it!